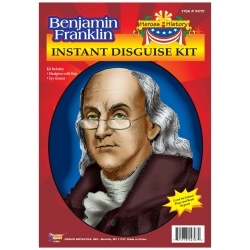 The Benjamin Franklin costume accessory kit is part of the Heroes in History collection. It is used to create a Benjamin Franklin costume that can be changed into quickly making it perfect for book reports, school projects, or school plays. The Benjamin Franklin costume accessory kit includes a balding headpiece with attached hair and square old fashioned gold wire frame eyeglasses. One size fits most children.